Grandma Jacob, dressed in a white cotton sari and blouse, opened the door of her new home on Rural Route 2, South Riverside, on a warm day in 1975 and looked into the blue eyes of the old Polish warrior. The sounds of birds and bees and wasps and dragonflies, and a thousand other creatures filled her ears - all making the best use of the short Michigan summer. His feet were planted at her doorstep like two oak trees. What a sweet man to befriend strangers! They could use more people like him in the world today, make it a better place for all, she told herself. A true war hero! And that daughter of his — so much like him. Without any prompting, she had organized such a successful glazing party to fix the shattered windows of their new American home. One look at the windows and you could tell they were far, far better than the original. Truly a marvelous girl, that Katerina! She’d make an excellent partner for life for her grandson, Solomon, but the poor boy had a hard time recognizing the true from the false in young women. What could a grandmother do but intervene? Without help, the poor boy would surely be condemned to a life of celibacy. Eager to speed up the relationship between the families, she warmed up. “Never encountered anything like that in my life. In Kerala, where I come from,” — she pointed into the far distance in the direction of her native place — “we use our tongues,” — she pointed to her tongue — “not stones” — she pointed to the stones in the front yard. “Our houses are so close to one another” — she illustrated distance, measuring with her fingers the space between them — “and our families have known one another for so many generations that stone throwing against someone else’s house is unthinkable. Especially in the Christian areas.” She shook her right hand to produce an emphatic negative. Henri made a mighty effort, but between what his hearing aid allowed and his limited English, he couldn’t understand what she was saying. Fragments, such as “thank you,” “very much,” “windows,” and “very kind” came across; but before he could restring them in his mind and make sense out of them, she was on to her next energetic word and hand gesture, which made it even harder for him to follow, not only because he couldn’t understand what they meant, but also because with each movement of her body, his heart raced and he had to restrain himself from grabbing hold of her and raining her with kisses. He was drawn to her voice, to the movements of her hands, to her body, and even to those alarming earlobes. Never in his life had he met a woman such as this! Intoxicated by her every movement, in a way he couldn’t recall ever having been affected, he stood there raptly, in the winter of his life, saying nothing, moving nothing, so that she wouldn’t stop and he could stand there bathed in the effulgence that had overcome him. He was glad that the woman of the house — and what a woman she was — had come to the door, and not the half-naked savage, who drove her like a slave and did no work himself. After what seemed an eternity, she did, to his dismay, stop — but he understood that all good things have a way of ending — and she waited patiently for him to respond. And when he didn’t, she waited for him to explain why he’d come to her door. While she stood in her doorway, feeling that it’d be impolite to force him to explain his purpose, Henri gathered his few words of English to make as much of an impact as he could on this beautiful savage. He was sure that she’d have as much trouble as he had understanding her, if he patched together too many words. Grandma Jacob decided that Henri had come to discuss the business of the Jacobs replacing the Domowskis’ beautiful cup that he, himself, had broken. She thought: The good man helped us, unasked, and fixed our windows; I must be reasonable and responsible in return. “I’ll buy a new cup,” she said, completely at a loss as to where to get one similar to the broken cup. She’d leave it to Solomon: he knew this country, this country that she’d thought she knew very well, but was getting stranger by the minute. “No, Missus, I pay.” He tried not to let his fascination for her ears get the better of him, draw his eyes to them like flies to sugar. He knew that it was unchivalrous and unbecoming to stare at such disfiguration. After all, could she be held responsible for the cultural practices of her tribe or her husband’s cruelty, whichever had caused the mutilation of her earlobes? “That’s very nice of you, Mr. Domowski,” she said, forgetting the abridged style. “But I can’t even think of you paying after all you’ve done. Solomon said you’re one of the good guys.” She smiled at her grandson’s use of the same label as the largest local car dealership. Grandma Jacob stepped back under the blast. “My husband,” she said to Henri, raising her shoulders, as if her words and the shoulder talk explained everything. Responding to the loud, commanding voice, not understanding what was said, but sensing that she wasn’t going to stand in her husband’s way on the matter, and afraid he’d get into an altercation with the half-naked barbarian and get both the Missus and Solomon in deep trouble, Henri thrust the package that he was holding into the beautiful savage’s hands and fled as fast as his knees would permit. Grandma Jacob stood in the humid Midwestern heat, in the American doorway, in her white cotton sari and blouse with her undeniably prominent earlobes — which were grizzled and leathery, yet soft in a lumpy way — and stared at Mr. Domowski’s departing figure, her eyes caught between amusement and bewilderment. Mr. Domowski’s quick departure, almost like that of an embarrassed suitor, was funny. Funny to my tailbone, she recorded to report to Solomon; but what was the package all about? Her teacher’s mind, albeit a re-bred one at this period in her life, but a sharp teacher’s mind nevertheless, started off by discounting all the possibilities. No, it wasn’t garbage. He was too sweet an old man for that, and one doesn’t fix the windows one day like the archetypal Good Neighbor, Good Samaritan, Boy Scout, and soon afterwards hand the neighbor garbage in a package. No, too complicated for the simple man. Mr. Domowski, her kindly neighbor, she decided, was a simple man, one of Nature’s simple creatures, with an uncomplicated cultural background. A man of singular intent. Grandma Jacob asked herself: Should I be focusing only on one aspect of my neighbor? Isn’t he more than that? Of course, he is. In time, he’ll become multidimensional, but the trait he brought to the fore this morning of his own volition will be a key to understanding and appreciating him. Used Christmas wrapping, in fact. No doubt about it. That didn’t displease her, only revealed Mr. Domowski’s careful nature. Up the ladder he went in her estimation. What a good match his daughter would make for Solomon! Grandma Jacob saved everything. The only reason that her kitchen wasn’t chockfull of her new American “unavoidable odds and ends” was because they hadn’t been in the house long enough. “Never waste, never want” was a motto she’d successfully passed on as a teacher and parent and, of course, grandparent. In her beloved grandson, it’d reached its peak in saving houses — in America, of all places, a country she frequently scolded for spending as if it’d never be in want. He’d taken her values, she was happy to say, from the individual to the societal. She thought, very logical, that dear, dear grandson of hers. Yes, of course, Katerina would doubtless make a good match for Solomon. As good as his mother had been for his father, although her Jacob had ranted and raved about all the dangers of marrying a fickle American in a divorce-infested land ravaged by racial prejudice and fears of miscegenation. “Not to worry,” she’d said calmly. “Our son has a good head on strong shoulders, and a heart big enough to make up for any deficiency in his beloved or in the world that they inhabit. It’ll all come out better than any of us can imagine.” And, of course, it had. Just look at Solomon, she thought. The green reindeer wrapping from a Christmas past — very long past, she noted — was held in place not with magical American see-through tape but with household twine, probably from a fabled American dime store. She examined the knot closely. One could learn much from these small evidences of training and inclination. Ten thousand years filtered through one life could get condensed down to one smile, one look, one brush stroke, one turn of phrase, or one knot. Actually, it was a mass of knots that held the twine in place, not just one. Curious, Grandma Jacob peered at the evidence of Mr. Domowski’s patient labor. She probed further. She must get to the heart of the matter, and of her kindly neighbor. He’d started with a basic knot, nothing complicated, she surmised, then, as if to make sure, he’d added one more of the same kind. To be surer, he’d done it again. And again, and . . . He’d stopped only when the length of twine he’d cut from the reel had run out. She wasn’t going to unwind and save this overknotted twine. She was sure that she’d do some injury to her nails if she tried. She reached for a pair of scissors. Was Mr. Domowski, she wondered, unsure of his knot? Or was he reacting to the world’s predictable, buffeting uncertainty? Or was he making sure he got full use of every millimeter of the twine after he’d misjudged the length he needed? Or was this the only knot that he knew how to tie? Definitely not the last, she decided. And, perhaps, all of the former. Simple man though he might be, he probably had a lot going on in his mind. “Jacob, come and see what our neighbor has brought us,” she said in Malayalam. “What is it? I’m writing my Sunday message,” he barked from the next room. “We’re in America now, Jacob,” she said, using his given name, which had become their surname upon getting married as was their Syrian Christian tradition in India. “Jacob,” she sang his name soaked in chocolate syrup. “Jacob,” she sang again. Long ago she’d given him notice that she wasn’t going to address him as Jacobachayan, which had the proper Malayalam honorific attached to his name. “Jacob.” A little less sweet. No use antagonizing him. He’d gallop into a fury. But now that they were where they were in time and geography, she thought of him as my Jacob, not husband or husband Jacob. American feminism had nothing to do with it. He was her Jacob, with all his furies and eccentricities. She loved him as her Jacob, part of it as her husband, but more as a person, whose vitality was never ending, even in this new land with its share of depressing surprises. With his much-traveled, leather-bound Bible — which he used to interpret and, of course, to control the world when he wasn’t trying to reform and antagonize it — he bounced back from each reversal in fortune. “What is it?” Eyes squinting, he loomed over her shoulder, no longer able to bear her silence or the mystery that her call had aroused. She opened the box. Six heavy white cups stared back at them in stark simplicity; a thin, earth-brown line circled the pearl-smooth porcelain a finger’s width from the inner rim. “Peasant cups!” Grandma Jacob clapped. Grandma Jacob ignored him. The cups were fascinating, as was the man who’d handed them to her in a package wrapped in ancient Christmas paper and bound with a mountain of knots. The stark contrast between the heavy white porcelain and the delicate brown line gave each cup a timeless beauty, the strength of earth and the grace of heaven. Why had her neighbor brought them this gift? 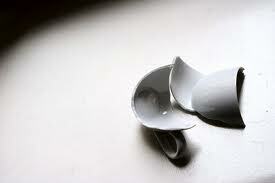 Was it some Polish superstition about making amends for breaking a cup in a neighbor’s home? For spilling coffee that had cream in it? A pre-emptive offering to prevent any reciprocal breakage in his house? A welcome-wagon type of contribution to a new neighbor? Or a good neighbor making amends for the ferocity of a bad one who had broken their windows? She couldn’t decide. She had insufficient information to go on. She’d endeavor to discover all that she could about Mr. Domowski. He was — after all she could say about his sweet, tongue-tied behavior, his generous help on the windows, and his old-world manners — Katerina’s father, and as Solomon’s grandmother, she wasn’t going to be the one to lose an opportunity to tie her own invisible knots, ones that no sharp instrument could sever. In her loose-fitting indigo-blue kimono, a souvenir of their days in Japan, June looked very Anglo-Saxon, as it accentuated her blond hair and pale complexion and light-blue eyes. No malice showed in her efforts. June liked to keep up to date on all the goings-on around the corner and as far as her grapevine went into Riverside City, Kalamazoo, and Grand Haven, and, in some instances, Detroit and Tokyo. Very little got past her without noting it for future detailed reports. She had a bachelor’s in journalism from Northwestern University and several years of experience on small-town newspapers; she’d abandoned her career after marrying Bill. Grandma Jacob crossed Domowski’s well-cropped lawn, admiring its centerpiece circle of roses. At her neighbor’s door, with a bare, unjeweled hand, she raised and lowered the brass knocker. A light touch. With the other, equally bare, hand, she held the freshly baked cake in a tray covered with an embroidered napkin. No one answered her gentle knock. The man, she decided, was hard of hearing. She looked for a doorbell. No evidence of one. “Calls for a louder knock,” she said aloud as a warning, in case anyone was listening behind the door. Another knock. No response. A bit crestfallen, she turned to leave. June Sterling emerged from her house, arms signaling vigorously, voice blasting, not wanting her private show to come to such a sudden end without an interesting conclusion that she could broadcast, first of all, to her most immediate audience: her husband. June smiled encouragement and pounded on her own door to show how it was done when knocking on Mr. Domowski’s door. This brought Bill running, and he had to be updated on the tide of events across the street. Unnerved by all this attention, Grandma Jacob smiled hesitantly and turned back to tackle the door. She wasn’t unfamiliar with the watchful eyes of neighbors, having flourished for so long in the close quarters of towns and rural areas in Kerala, but this was a first for her: knocking on the door of a widower all by herself. Gingerly, she formed a fist and attacked the door. That was an effort without any weight to speak of behind it, almost like a bit of down, she decided. It wasn’t that she lacked the strength or the power or the will. But how could she shake off a childhood of rigorous training, a lifetime of accepted practice, and a time-honored custom of what to do and what not to do when it came to relating to a neighbor’s door? And, as a schoolteacher, hadn’t she passed on the knowledge that had been passed on to her about what should and shouldn’t be done to doors? Who’d believe her doing what she was doing to this door? she thought. She struck the door several times, during which Bill Sterling had to hold his wife back to prevent her from rushing over to help out the older lady. Grandma Jacob’s knuckle knocks drew no response. So gathering up her still-considerable physical strength to deliver a louder message before Mrs. Sterling came over to lend a muscular American hand, Grandma Jacob communicated with a kick that she’d often used on persistent, rabid pariah dogs back on the dusty streets of her village. The door rattled. The kick was pure pleasure. A lifelong martial arts devotee, she needed to restrain herself from demolishing the door, thus releasing the physical tension of worrying about her grandson. But wasn’t a second kick definitely required for the noise and vibrations to penetrate the old man’s impaired hearing and doddering sensory antennae? “Wassamatta?” came back an offended old bull’s bellow, far from doddering. “Eureka! Success at last! That reached him,” said Grandma Jacob under her breath. She turned slightly and smiled in the direction of her audience. Henri swung his well-oiled kitchen door open with a belligerent scowl. And there stood the cookie-colored, Mrs. Gandhi-look-alike neighbor lady with the strange white body wrap and doughnut-shaped earlobes, his beautiful, gentle neighbor lady, and she was holding a large tray. He wouldn’t dislike that. He’d just been leafing through old copies of National Geographic, and exotic foods prepared in faraway lands appealed to him at the moment. He’d yet to find the issue reporting on women with large earlobes; but he’d seen plenty of savage people resembling the half-naked fat man next door. As Henri held the door open, Grandma Jacob took a quick peek and saw in the half-light what appeared to be a comfortable, enchanting old farmhouse kitchen. What a tidy kitchen! Goes well with the beautiful circle of flowers, she thought. “Hello to you in return, Mr. Domowski,” said Grandma Jacob, who, despite the contrary indications of her enlarged earlobes, had learned her king’s and queen’s English directly from Oxford- and Cambridge-trained Scottish and English missionaries. “Okay, Missus. You go cook Mister dinner. He no like cake, I like your cake. Sure, you good cook,” he said, as if his opinion should settle her mind on the issue, if not please her. Although he relaxed his hold in seconds, Grandma Jacob was bent forward in excruciating pain from her finger joints pressed hard together. A perfect sadist, she thought. No more cake for him! And then he bent over her hand and kissed it gently right at the knuckles, and a soothing warmth radiated outward from where he’d planted his lips. As her ever-active brain processed the seldom-experienced feelings coursing through her and threatening to make her swoon like a young girl, she thought, The man’s really an old-fashioned European romantic. But she’d seen too much, and she knew too much to lose all her senses so quickly. She provided her burgeoning sensations the appropriate, time-tested corrective: he shouldn’t be kissing a married woman’s hand, even in courtesy, especially not a preacher’s wife. This time it was she who fled as fast as her sari and her aged but spry limbs would let her. Bill Sterling had stood at his window, eyeing the progression of whatever it was that was being played out next door, inducted into the role of interested observer by June, who had reluctantly detached herself from the window to answer Wilhelmina’s call, when she heard of the unfolding “courtship” within the Sterlings’ line of vision, she wanted a running commentary. “Wilhelmina, you should have seen it! She was virtually running in that dainty fashion that Indian women have in their saris. And she — an old woman — she seemed flustered. I don’t blame her. I was, too, when he did that to me. A kiss on the cheeks — now that’s being formal. On the hand, well, in this day and age, you don’t know how to take that. Is it intended as an old formality that we’re no longer accustomed to, or is it a male advance? Something’s brewing. Is it romance between the old Polish warrior and the little Indian woman, or is it old-fashioned match-making that’s in progress? I know that you and Mrs. Smith worry about Solomon, especially after the windows were broken. Bill and I do, too. © Hackwriters 1999-2016 all rights reserved - all comments are the writers' own responsibility - no liability accepted by hackwriters.com or affiliates.